This Tudor home build in 1923-24 would fit in an elegant section of a city, yet stands by itself in a rural area on U.S. 89 at the south end of Centerfield. The house, sometimes called the Sugar Mansion, was built for the superintendent of the historic sugar beet plant, which was located directly across the highway for about 60 years. yet there are no other houses nearby. And, as historic homes go, the structure isn’t very old, having been built less than 100 years ago. Yet, it has a fascinating story to tell. The current owner is Vicky Larson, who with her late husband, Juan, started the Freedom Ford dealership in Gunnison. They bought the home in 1975. But many people believe the home was originally built at the behest of William Wrigley Jr., founder of the company that made—and still makes—Wrigley gum. In the early 1900s, a big sugar beet processing plant was located directly across U.S. 89 from the Tudor-style home. In the 1920s, the plant changed hands. While there’s little proof, evidence suggests Wrigley was the buyer. He supposedly had the house built for Hart Sanders, the plant superintendent at the time, and the Sanders family. Because of its location across the highway from the sugar beet plant, the house started to be called the Sugar Mansion. 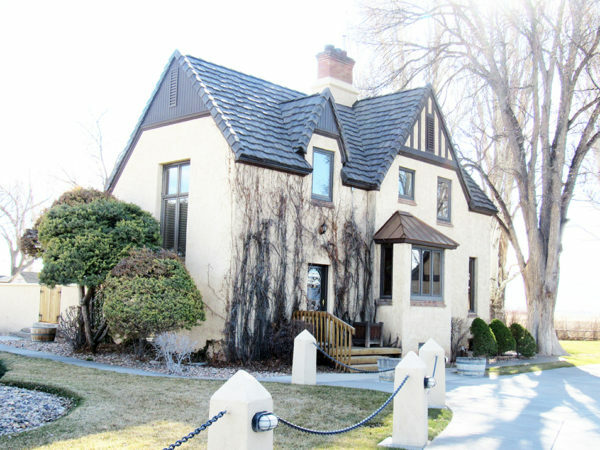 Larson, has a framed certificate proclaiming the house to be on the Sanpete County Registry of Historic Places. The title of the home on the certificate is the Sugar Mansion. A major addition to the home, possibly inspired by the owner’s memories of life in Hawaii, is the walled patio located on the south side, which is accessed from a south-facing door. The door was originally the front door to the home. ansion” is a bit of a stretch. It size and scale is typical of a 1920s three-bedroom house. But some of the home’s features, such as a master bedroom containing its own bathroom, and a Jack-and-Jill bathroom built between the two smaller bedrooms, indicate the home was probably considered quite fancy when construction began in 1923-24. In the 1920s as well as today, it is common for businesses to use holding companies to conceal the identities of owners and investors. Yet there is considerable evidence supporting stories of Wrigley’s involvement with the sugar beet plant and the Tudor-style home. 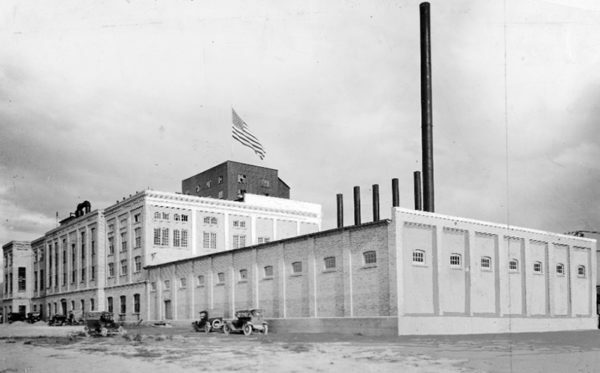 Wikipedia cites a Utah State University publication about the famous Utah-Idaho Sugar Company, which states that in 1920 “the William Wrigley Jr. Company purchased the factory to supply their chewing gum production.” The article says U & I acquired the Centerfield factory in 1940, closed it in 1956, reopened it from 1958-61 and then sold the whole operation as scrap in April, 1966. According to Jensen, three smaller homes were built alongside the Tudor home, but eventually those homes were moved, leaving the big house by itself. The title work done when Vicky and Juan Larson purchased the home in their fifth year of marriage consists of a thick folder containing more than 40 legal documents dating back to 1882. The original land patents were granted by Chester A. Arthur, the 21st president of the United States. A total of some seven or eight different parties held title to the land prior to the home being built on it. And, following the sugar plants closing, a total of five different couples, including the Larsons, have owned the home. The first was Clarence and Christena Madsen, who bought the home from Gunnison Sugar Inc., a subsidiary of the Utah-Idaho Sugar Co., in 1954. Christena Madsen became known for the beautiful gardens she created around the home. When Juan and Vicky Larson made their purchase, they were buying their dream house. At the time, Juan was 24 and Vicky one year younger. Over the years, they happily enjoyed living in the home and raising their son, J.L. there. Since Juan’s death in 2011, Vicky has continued to live in the home and, with J.L, continues to operate the auto dealership. When asked to describe what she and Juan have done to the house, Vicky’s short answer is, “Not much.” Their first improvement, which took place almost immediately after they moved in, involved changing the carpeting, which was 50 years old. “And soon after changing the carpets, we also had to fix many of the window frames because most of the wood was warped, cracked, and split,” Vicky recalls. To get better control of drafts and reduce their heating bills, they changed to newer style double-pane windows without the many small panes found in traditional Tudor windows. 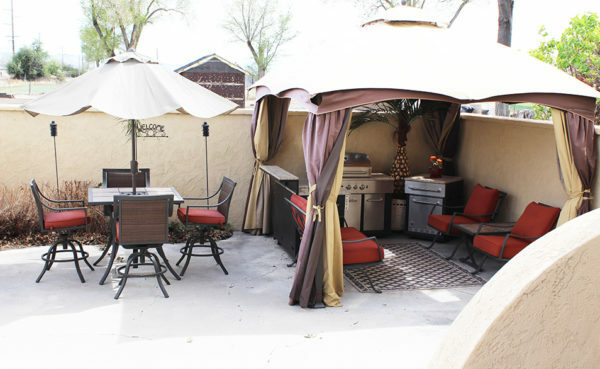 A major improvement which the couple and the son greatly enjoyed was the addition of a patio, complete with a built-in outdoor kitchen, on the home south side. Most recently, Vicky has had to replace the roof’s original split-cedar shingles, then about 90 years old. She felt lucky to find a more modern material with somewhat similar appearance and beauty. Vicky and Juan knew each other during high school but didn’t begin dating until after both had graduated. After graduating a year ahead of Vicky, Juan went to live in Salt Lake. After Vicky’s graduation, while visiting family in Salt Lake City, she decided to be daring and give Juan a call. After the phone call, they started dating and soon fell in love. Almost immediately after marrying, the couple moved to Hawaii. As a youth, Juan had worked with horses under his dad’s tutelage at Broken Arrow Ranch outside Gunnison. In Hawaii, he went to work as a wrangler on a ranch owned by descendants of the famous Captain Cook. Historic sugar beet plant in Centefield. After living just one year in Hawaii, the Larsons realized the laid-back life style of the islands was not for them, so they returned to the mainland and settled in Salt Lake City. 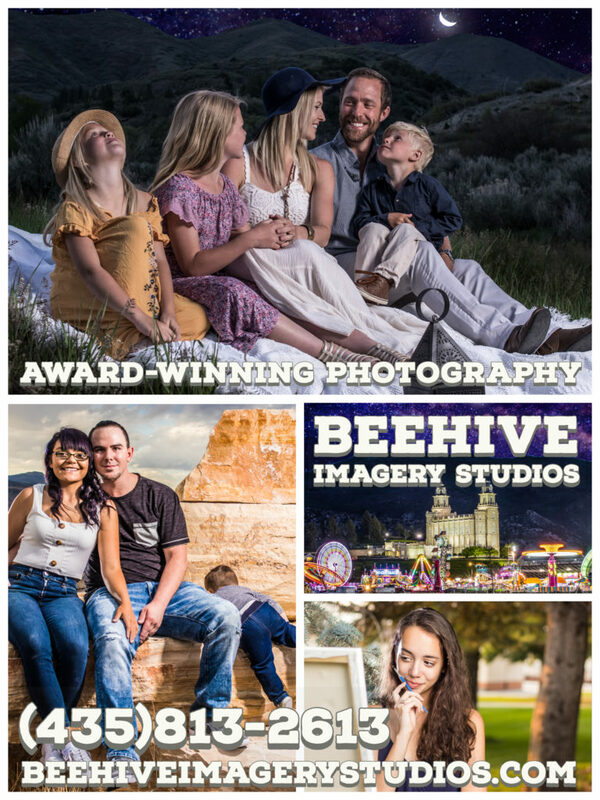 After a few years in Salt Lake, they decided that city-life was not for them either, so they returned to Sanpete County. 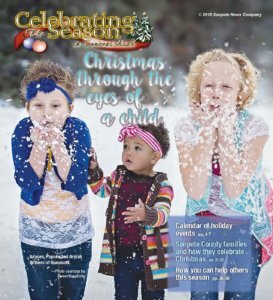 During their first year back in Sanpete County, they rented a mobile home in Gunnison. After that, they rented a place on the road to Palisade State Park for a couple of years. sugar built (or was it chewing gum? ).